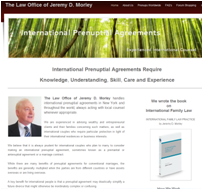 We are pleased to announce the launch of www.internationalprenuptials.com, our website focused on international prenuptial agreements. The explosion of international relationships creates a tremendous need for sophisticated international counsel to structure international prenuptial agreements. We work collaboratively and collegially with lawyers around the world to structure prenuptial agreements for engaged couples with international connections. The issues that such agreements raise are frequently far too complex for local counsel to handle them alone. We have great experience in advising wealthy and entrepreneurial clients and their families concerning these issues, as well as international couples who require particular protection in light of their international residence or business interests. It is always prudent for international couples who plan to marry to consider making an international prenuptial agreement, sometimes known as a premarital or antenuptial agreement or a marriage contract.